Vanities from the store shelf are available in a wide range of sizes. Actual dimensions of bathroom vanities might vary from very compact single door or triple drawer with exact measurements 18 x 21 x 34 inches in width, depth and height respectively to large 72” wide double sink vanity which might be a great solution for a huge master bathroom. Height of vanity cabinet usually do not exceed 34.5” plus 1 – 1 1/2” thick stone or manmade materials top will bring the total size up to 36 inches. Depth typically stays within 18” – 23”, but 21” deep cabinets very widely used. Width typically does not have limitations. Manufacturers offer their own sizes and actual dimensions, but still some standard widths of vanity cabinets are: 18”, 24”, 36”, 42”, 48”, and 60”. Unlike kitchen cabinets dimension, bathroom vanities very often a free standing units and the actual width doesn’t play a big role in fitting into a certain standards. Some vanities might be 26”, 37” or even 24 ½”, 25 ½”, 30 ¼” wide. The size usually an essential factor in defining the vanity cost, but style, design and quality are the prior factors of the price determination. 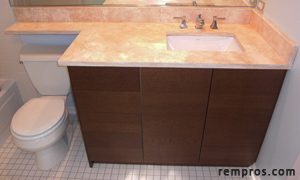 While free-standing vanities are among the most popular options there is number of other types and shapes worth to consider while shopping for a new vanity. Dimensions of such products will be determined solely by the manufacturer, particular design and style won’t be standardized by any parameter. Corner vanities typically have two equal sides 26” – 32” long and might be as high as 40” including top part with a sink. Wall mounted vanity might be a good option for a contemporary bathroom design. Actual height of such option might vary from 19 to 27 inches (48 – 69 centimeters) and installed at 34” from the floor to top will give 7” – 15” open space underneath. Some stylish wall-mounted solid tops are really narrow about 5 – 7 inches thick and mainly serve as a support for a sink. Wall mounted sink will be the least space consuming option. Also some homeowners might consider a 19”W x 14”D x 37.5H pedestal vanity. Vanities can be sold as one unit including the cabinet, vanity top and (or) sink with overall dimensions of assembled product reflected in manufacturer specifications. At the same time, many vanities available as separate parts. Buying cabinet alone, the top can be possible to order from any local stone fabricator and choose a desire style sink. Such option is very popular and preferable for many homeowners due to flexibility in design and versatility of styles available to choose from. Proper dimensions are important factor to analyze prior to make a vanity purchase. Actual measurements have to be proportionally adequate to overall bathroom space. Very limited bathroom area might not allow accommodating oversized vanity and all desire fixtures at the same time. Vanity type is also matter. Identical in sizes vanities might have only one distinction – number of sinks. If the space is limited but having two sinks in the bathroom instead of one is preferable it might be better to get most of its usage placing compact double vanity rather than same size vanity with a single sink.